SHREK THE MUSICAL opens SHREKtember 19! HomeMeralco TheaterSHREK THE MUSICAL opens SHREKtember 19! 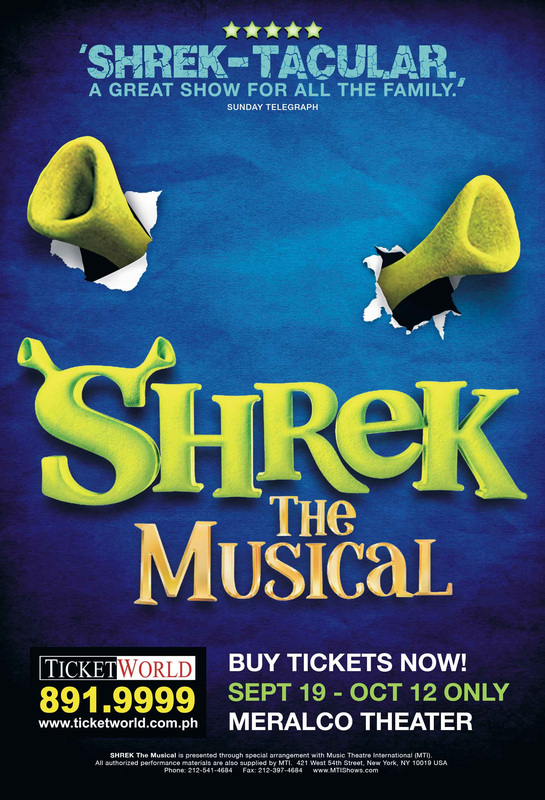 Manila, Philippines -- This September is going to be SHREKtacular! Everyone’s favorite ogre comes to Manila in Shrek the Musical, a song-and dance-filled stage adaptation of the Oscar-winning DreamWorks animated film. Shrek the Musical opens September 19 and runs throughOctober 12 at the Meralco Theatre. Shrek The Musical puts a twist on fairytales as we have come to know them. Instead of a knight riding a noble steed, the hero is Shrek, a swamp- dwelling ogre who befriends a wisecracking Donkey. And the Princess? She’s the slightly temperamental and neurotic Fiona. After Shrek rescues Fiona from a dragon-guarded tower, the two fall in love before she reveals there’s more to her than meets the eye. Other fairytale misfits join the madcap adventure in this colorful musical including a brave puppet named Pinocchio, a Gingerbread Man with an attitude and Three Blind Mice who channel their inner Dreamgirls. This entertaining, family-friendly show features a terrific score including the hit song “ I’m A Believer!” The songs come from Jeanine Tesori, who wrote the music, and David Lindsay-Abaire, who wrote the book and lyrics. Shrek the Musical also draws from a 1990 children’s book by famed New Yorker cartoonist William Steig. Like the first 2001 Shrek film, the musical stays true to Steig’s fractured fairytale vision where dragons are friendly, swamps are better than castles, and the true hero isn’t handsome or noble but a grouchy-on-the-outside, tender-on-the-inside ogre who is more or less content with himself and his life in a swamp. After Shrek the Musical premiered in 2008, as the most expensive show ever produced on Broadway, it played for more than a year and earned numerous Tony and Drama Desk Award nominations. It went on to become a hit musical in London’s West End and continues to tour the UK.